This article was first printed in the November 1963 issue of TekTalk. 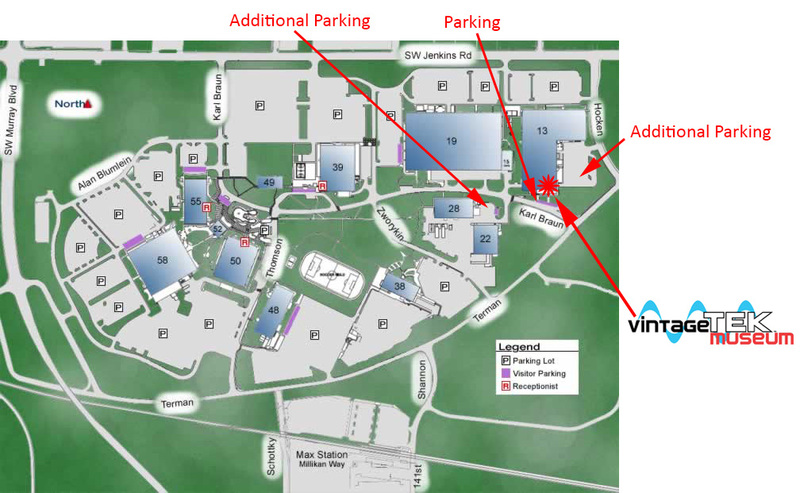 Roads in Tektronix Industrial Park have been named after three outstanding scientists who have contributed much to physics and electronics: Robert A . Millikan, A. A. Knowlton and Karl Braun. 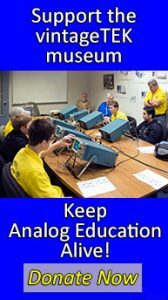 This article will discuss some of Millikan's contributions. 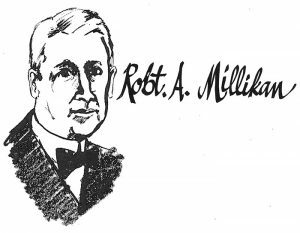 Robert A. Millikan was awarded the Nobel Prize in physics in 1923 for his study of the electronic charge and the photoelectric effect. Millikan was born in 1868 in Morrison Ill. He graduated from Oberlin College in 1891 and received his doctorate from Columbia in 1895. He also attended the universities of Berlin and Gottingen, Germany. In 1896 he became assistant professor of physics at the University of Chicago. In 1910 he became a full professor. In 1921 he resigned his chair at Chicago to accept the directorship of the Norman Bridge Laboratory of Physics at California Institute of Technology. He later became chairman of the executive council of the institute, which position he held until his retirement in 1945. Millikan represented the United States for 10 years (1922-1932) on the League of Nations committee for intellectual cooperation, one of the social and economic committees whose advice was often sought in connection with political disputes but whose main function was to organize and extend international cooperation in social and economic affairs. The work for which he was most famous was his precise measurement of the charge carried by the electron. This work began in 1906 and lasted more than 10 years. Previous attempts to identify the electron and measure its charge had been made by J. J. Thompson and H. A. Wilson in England. Their method was to observe the speed of minute water droplets falling in an electrical field. As the electrical field was changed, the droplets fell at different rates, depending on their size and on the electrical charge. The method was not accurate because the d1·oplets tended to evaporate and give inconsistent measurements. In 1906, Millikan took up the problem. Using Wilson's technique, he tried various methods to obtain greater consistency. He did succeed in obtaining much better values simply by shortening the time of observation, which reduced the error clue to evaporation, but he still was not satisfied. By experimentation he finally hit upon the method of adjusting the strength of the electric field to hold the droplets stationary, assuming that he could then observe the rate of evaporation and allow for it. The method was not wholly successful, but he did find it was possible to hold the droplets stationary for nearly a minute. In 1909 he discarded Wilson's method and substituted oil droplets about 1/ 1000 millimeter in diameter, which could be observed by a telescopic microscope in a chamber of his own design. Because the droplets were electrified by the friction of spraying, they did respond to an electrical charge placed on plates at the top and bottom of the chamber. Oil had the advantage of practically no evaporation, so the droplets could be treated as a constant. Millikan was able to observe that under the force of gravity, all droplets fell at identical rates but, subjected to a constant electric field, the rates of the droplets varied from one to another. Because the times of passage through the electrical field occurred in exact rather than fractional steps, Millikan assumed this was due to the effects of 1, 2, 3, 4 or more electrons giving an electrical charge to the droplets. By taking into account the droplet's size and weight, the force of gravity, the friction of the air and the electrical charge on the plates, he was able to calculate the charge of an individual electron. Hardly less important than his work on the electronic charge was the work he did on the photoelectric effect and cosmic rays. In 1923 he was awarded the Nobel Prize in physics for the first two. Millikan's greatest contribution to science was to establish beyond a reasonable doubt that which had been only theory. By showing that electrical charge always consists of exact multiples of a fundamental charge, he was able to identify and give. a value to the charge on the electron. Likewise, he established the validity of Einstein's equation for the photoelectric effect by subjecting it to the severest possible tests.